Lloyd George was elected Liberal MP for Carnarvon Boroughs in 1890, a seat he held for fifty-five years. He became Chancellor of the Exchequer in 1908. In 1909 he introduced old-age pensions and, in 1911, the National Insurance Act, a scheme against ill-health and unemployment. He backed the war in defence of Belgium in 1914 and in 1916 became Prime Minister. He is remembered as one of Britain's greatest wartime leaders. He remained Prime Minister in a coalition government until 1922. 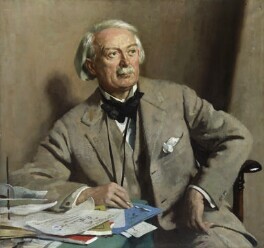 A celebrated orator, his last speech in the House of Commons in 1940 attacked Prime Minister Neville Chamberlain, and helped bring about the succession of Winston Churchill. Portrait of the Day talks are given by members of the Gallery's Visitor Services Team and last for up to 30 minutes. Talks are subject to change so please call 0207 306 0055 on the day or check signage in the Gallery.